Space Invaders Get Even - One day, thirty years ago, Earth was suddenly attacked by alien life forms known as the Space Invaders. Oh God, not only is it time for screenshots taken from a Wii with our cobbled-together capture setup, it's time for screenshots taken from a dying Wii that sometimes has these weird blocks appearing on-screen like you're seeing into the Matrix or something. Now, if we could move games between Wiis, that'd be fantastic, we could get them on our newer Wii that can play Twinkle Queen, but oh noooo, that'd be too simple. Thanks, Nintendo. Anyway, click the screenshots to make them bigger and weep, weep, because this is what we have to work with. So much for preserving WiiWare through the medium of screenshots! Just like Jewelry Master Twinkle, Space Invaders Get Even is another victim of a digital marketplace shutting down. Once again, we must preserve the dead! While Jewelry Master Twinkle had a verifiable history, with the PC closed beta and all that, Space Invaders Get Even may also have a weird backstory to it... One that we, sadly, cannot confirm with certainty. A few places, including Wikipedia and Nintendo Life, say the game was originally considered for a retail release- something that would've saved it from disappearing when the Wii Shop Channel closes forever in 2019- but was instead shifted to WiiWare, split into four different content packs. Thing is, the source for this is given as this Dengeki article which, er, says nothing like that at any point. The only other source is this Japanese blog which links to the Dengeki article with a bit of extra commentary, and adds that it was meant to be a retail release. So, without a direct source, we can't say for sure- perhaps the Dengeki article was edited later?- but if you look at the game itself, it certainly feels like a game that was hacked apart from something bigger (perhaps substantially, as those WiiWare file size limits were a big problem for developers). If that origin is true though, Space Invaders Get Even could've been saved from vanishing into the ether with all the other WiiWare games! It was even released to celebrate the 30th anniversary of the original Space Invaders, but when that Shop Channel stops accepting new Wii Points purchases, you're outta luck. Have we lost a little gem? Let's find out. 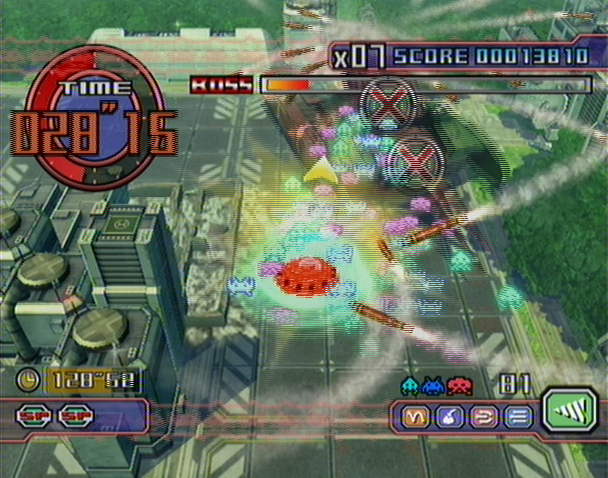 Developed by a multitude of companies, including Y'sk and INTENSE, but with primary work by Cattle Call- better known for the PS2 Arc the Lad games and the 3DS RPGs The Legend of Legacy and The Alliance Alive, and they also worked with Y'sk on Shinjuku no Ookami- Space Invaders Get Even is a profoundly odd take on the Invaders legacy. The game has a voiced intro so stony-faced and serious that we took it upon ourselves to record it and preserve this wonderfully-acted piece of narration. To sum it up though, when the Space Invaders attacked all the way back in 1978, humanity was doomed until a team of scientists created the Core Cannon (that's the official name of the player ship from the original Space Invaders, you know!) which drove the Invaders away, one shot at a time. 30 years later, however, and the technology of the Core Cannon lead to a new arms race, and to directly quote, "Humanity found that, even now, it could not give up war". Yes, it really says that. Amid this turmoil, a UFO of Invaders returns to Earth, to exact revenge for what happened 30 years ago. As the Invaders, you must destroy all the remaining Core Cannon technology on Earth, while the puny humans try to resist your invasion with whatever they've got to hand (some of which, as it turns out later, is not of Earth). Settle the score and show those Earthlings who's boss! 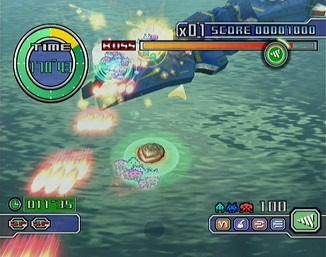 The game itself is an unusual beast, with elements taken from top-down Commando-style shooters, bullet-heavy shmups and crosshair/point-and-click shooters, and a light focus on approaching each stage as a score attack. 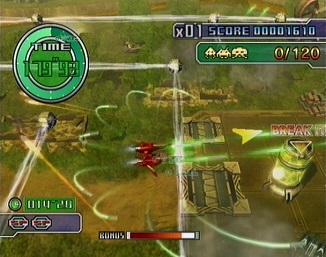 Each mission has three different stages in it, with the first two having objectives such as destroying target enemies like gas tanks and mech volcanoes, abducting cows or rescuing captured Invaders, and the third is always a boss battle with one of Earth's super-weapons powered by the Core Cannon technology. 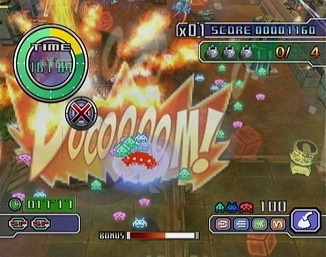 As the Invader UFO, your toolset is pretty diverse, with a speed mode to get across the map quickly (but being unable to fight back) being especially helpful given you have a time limit, and the UFO Bomb damaging everything on-screen and restoring your Invader count, but the main unique element here is your UFO's Invader-based attacks- you start each stage with 100 Invaders surrounding you that can be whittled down by getting hit, and they're used for your attacks aimed with the Wii Remote, as you literally throw them at the Earthlings. These include weak but rapid-fire Shot and Homing attacks, stronger but slower Bomb and Drill attacks, plus the balanced Bouncing shot that's a compromise between both but is a bit unpredictable. 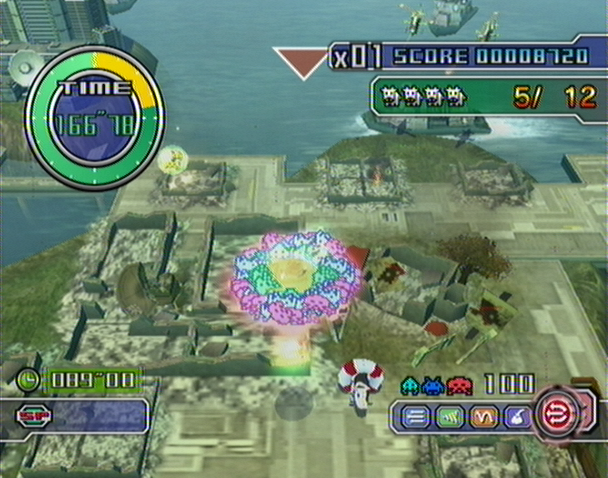 The animations for these are pretty comical- you're literally chucking these pixelated Invaders all over the shop, an inventive interpretation of what was happening in the 1978 game in a way, and the Wii Remote is fairly reliable, so you won't be missing your mark too much. It takes a little time to get used to the recharge rate on the more powerful shots, but you'll be using all of them in equal measures, so you won't find one shot being way overpowered. Additionally, some shots come into their own in specific situations, such as the Drill being handy for stationary bosses, the Shot taking down homing missiles easily, and generally it feels satisfying, given the chaos you can wreak across each area. The main issue with the controls is that, when not in speed mode, your UFO is slow and not ideal for evading the many attacks flying your way, so you'll be running away a lot. Sadly, don't expect to weave deftly through bullets in the slower attack mode, as the collision detection is very much against your UFO- you will get hit when you swear you were clear. Hitboxes, man. 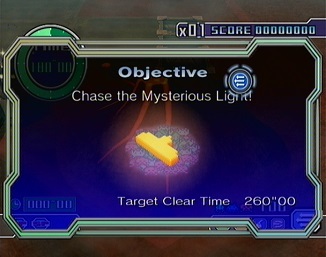 Every direct hit to your UFO also shaves a few seconds off the timer (and Invaders that get hit are destroyed- shake the Wii Remote or find other means to replenish them) so evasion, picking off easy targets for extra seconds, and finding cows to abduct and Stonehenge monuments to refill the timer becomes your priority when you're taking a beating. Overall though, it's a neat set of mechanics, allowing you to take a few different approaches, and when one shot type won't work in a specific stage, you can switch to another and see how you get on. As for the levels themselves, this is somewhat complicated by the distribution method. As we said, the game was split into four chunks at 500 Wii Points each, with the 'Starter Pack' only offering the initial Get Even Mission, and the other three Mission Packs offering Missions 1 & 2 plus a playable classic-style UFO, Missions 3 & 4 plus a playable Silver Hawk from Darius, and Missions 5 & 6 plus a playable R-Gray 1 from RayStorm respectively. 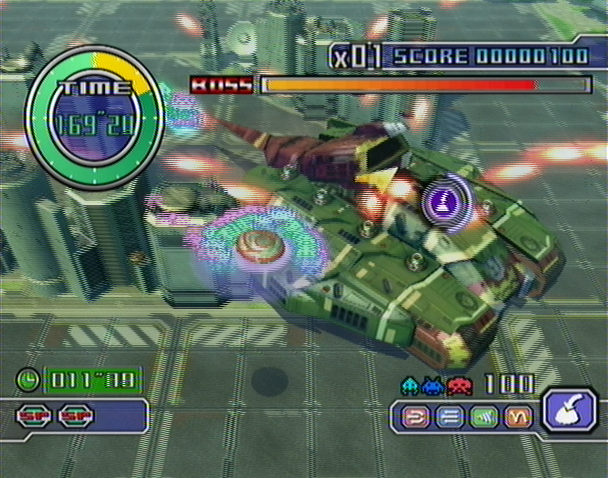 On the one hand, the game tries to alleviate the possibility of players picking and choosing specific level packs and not others by offering as much variety in the missions as possible- some stages hem your UFO in via electric gates throughout the mission, others divide the stage up into mini boss fights, and so on. 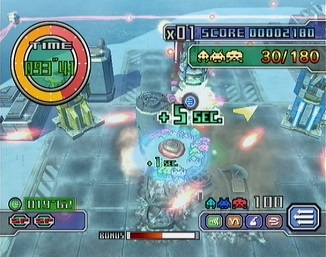 The problem is that the game has no difficulty curve at all- the difficulty fluctuates wildly if you play the stages in the intended order, with some 'early' missions actually being a lot harder to complete than the 'later' ones due to the number of enemies and the time deduction of their attacks. Once you buy a mission pack you can start from the first mission of any of them, so you can move ahead if you're stuck, but it never properly feel like the game escalates properly, flitting between very easy and much harder stages with wanton abandon. That kind of highlights the main issue of the game, though- it feels undercooked. It's not so much that the mechanics are bad- they do the job, and there's utility for all five of your shot types- but something about the game's structure misses the mark. It tries its best to present itself as an arcade, score-attack game- there's the limited timer, the bonus you get for remaining time, having points deducted for getting hit, and so on- but it feels less like a focused, tightly-constructed arcade game, and more like a toybox, something that's fun to mess around in. I imagine that's how it started in development- almost like a plaything, something you can goof around in at your leisure, but the score attack elements were grafted on later (especially the score multiplier for constant destruction which seems like a total afterthought) and it just doesn't quite nail it, so I never really felt much of an incentive to try again and do better. I think part of that can be blamed on the visual chaos that the enemy bullets and the destruction of buildings creates- it's certainly satisfying to lay waste to the city below you, but there's so much going on at once with your Invaders flying around and enemy attacks and so on, and the view is so zoomed-in that it's very claustrophobic and it feels you don't really have control over the situation, disincentivising you from learning to get better. It really doesn't help that the bullets of ground-based enemies take a second to reach your elevation, so it's hard to tell when they'll hit you and when they won't. It's visually busy, to its detriment. I think a few adjustments to the general structure, as well as the visuals, would help alleviate this- switching the focus from specific targets or objectives to simply destroying as much as possible in an allotted time may dampen the variety a bit, but I think it'd suit the game's mechanics better, finding the most efficient weapon types to rack up the highest score while you still have time. Given that some weapons are more effective on specific targets, it seems to me that would've been the best approach, taking into account recharge times and planning your route would've added a lot more meat to the game's bones. What the game absolutely has in its favour, though, is its charm. I know, I know, 'charm' is nebulous and subjective, but it's worth discussing. 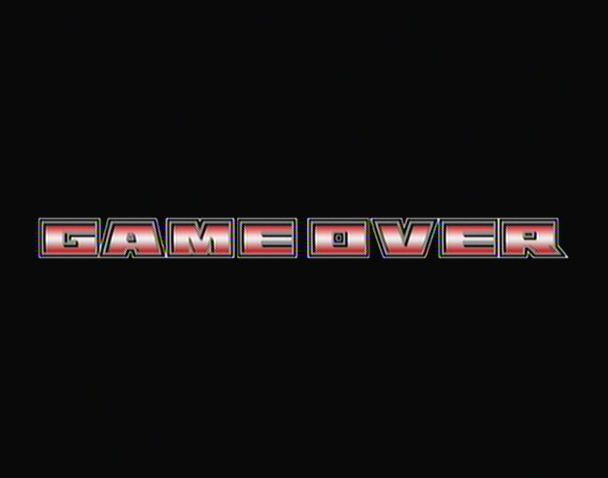 As I said, the opening narration plays itself completely straight with its serious retelling of the original Space Invaders, but in the game itself it's a little less so. Throughout the game, your Invaders intercept radio chatter from the humans, and this is both used to tell what little story there is and also offer comic relief. 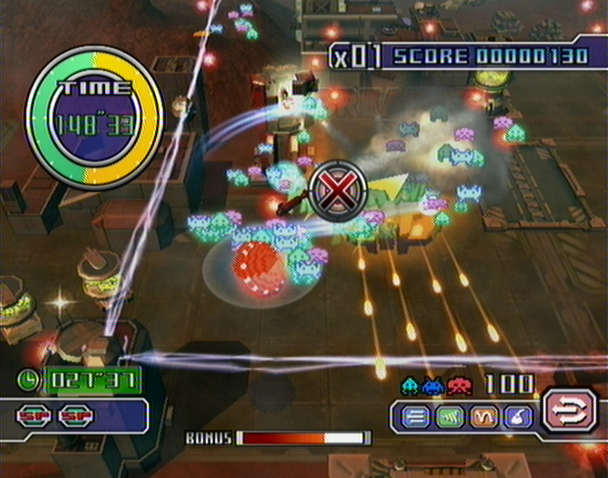 In the story-centric bits, they fill the player in on what the Core Cannons actually are and, later on, how the humans captured Invaders, started making their own, and even utilise the Invader's own UFO against them in the final battle, but it's told in such an over-the-top way it's incredibly endearing. Outside that, there's little nods to the 1978 game (with the humans referring to the famous 'Nagoya attack' technique and how to get the most points from the UFOs), over-acted goofiness (gloating when they trap you, and telling you SPACE WEIRDOS where to go) and, when you're defeated, elation, declaring "We did it! Humanity wins!". Sadly, some of the generic chatter repeats a bit too often, but you can turn it off if you wish. Also, while the visuals are, as I said, a bit too busy sometimes, they also add a lot of character, with comic book-style exclamations when you land big hits, including DOOOOOOOOOM! (a lost opportunity for DOGOON to come back) and they help give the game a comedic, ridiculous tone. This was obviously an angle that was being aimed for, so it does give the game a lot of character and charm. I just wish the game itself turned out a bit better, as the concept itself is great! The controls work fine, the tone is ridiculous and overly-dramatic in its story yet silly in its other elements, and there's a germ of a neat game hiding in here. To the point where, whenever WiiWare came up in conversation, this game was one I would always mention because it stood out that much! Upon closer scrutiny though, it doesn't manage to break beyond averageness. It's certainly not terrible, just more like a wasted opportunity, and had it taken more an arcade-like direction, there could've been something really great here, but as it is, it's a fairly decent toybox that's just sort-of stuck in a package that doesn't do its mechanics justice. 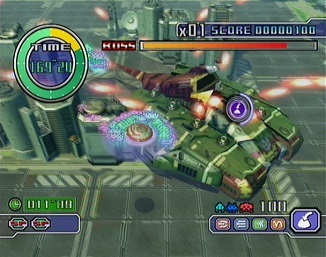 On the plus side, the 30th anniversary that this release marked was also used as a springboard for Taito to release Space Invaders Extreme on the 3DS, a game that would be an influential release in terms of the direction the Space Invaders franchise would take, leading to the likes of Infinity Gene and the use of Invaders iconography in Groove Coaster (although, of course, we can also pin that on Taito wanting to stay as far away from Invasion Day as possible). So, that 30th did have an effect on the series as a whole, just not through Get Even or the efforts of Cattle Call (and everyone else involved), and when the Wii Shop Channel shuts down in 2018, among many other things we'll be losing an interesting but flawed blast-em-up with you as the Invaders of Space. I guess that's a sad ending, but oh dear, never mind. A small party bag for the Invaders' birthday. We only mentioned it in passing above, but we may as well talk about the game's two guest ships here! Once you have all the Mission Packs, you have a total of four playable ships. Two use the standard game mechanics- the Normal and Classic UFOs- but the others are honoured guests, which play a lot simpler and don't require the pointer cursor. They're the Silver Hawk from the Darius series which comes with an upgraded shot and missiles that drop to the ground from below the ship, and the R-Gray 1 from the Ray series (specifically first appearing in RayStorm) which comes with a standard shot and its famous homing lasers. 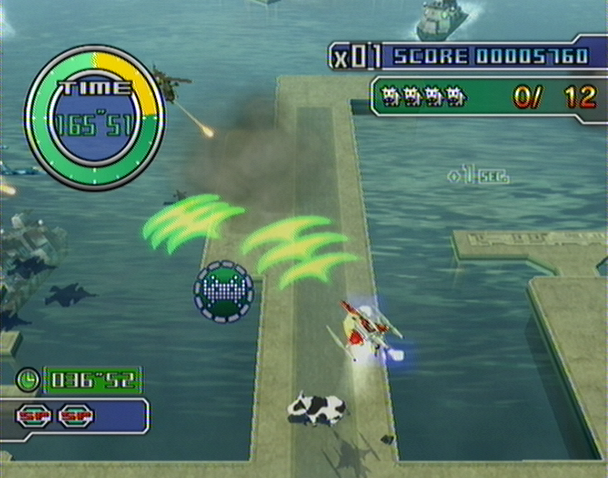 Both ships can also lock their firing direction and move by holding the Z button on the Nunchuck and... Uh... That's it, really. 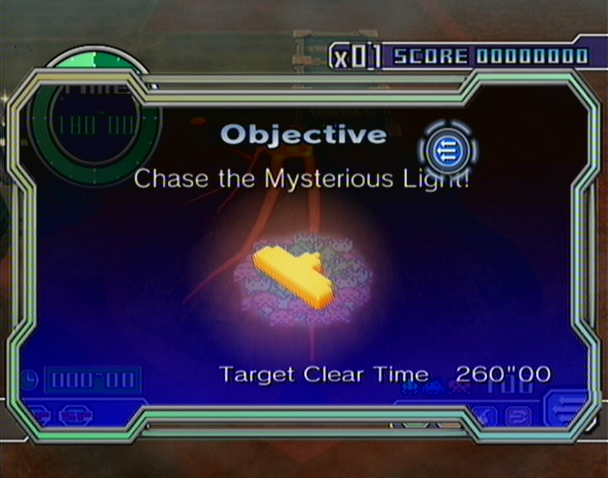 They're not quite as interesting to play as compared to the UFOs, but they're a nice little extra, I guess. However, your scores won't be saved if you use them, so you'll have to play the game the normal way to do that. There's a lot of weird Space Invaders games out there, eh? We hope to cover as many as possible! Please look forward to it.